What would be the right reasons to go to A&E? To take off your broken nails or check your rash? These tales seem unreal but were all based on true events at A&E. The hospital’s A&E departments are for accidents and emergencies only. That is why NHS Arden Commissioning Support has put together Dee’s story. 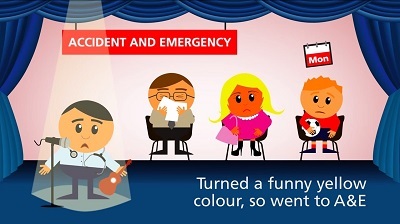 Watch, enjoy and make sure you know when you should go to A&E and when you should choose a different healthcare service for help. GP practices, GP out of hours services, pharmacies, walk-in centres and NHS 111 (dial 111 any time, day or night) can all help with urgent healthcare needs that are not life-threatening emergencies.